Akihabara. 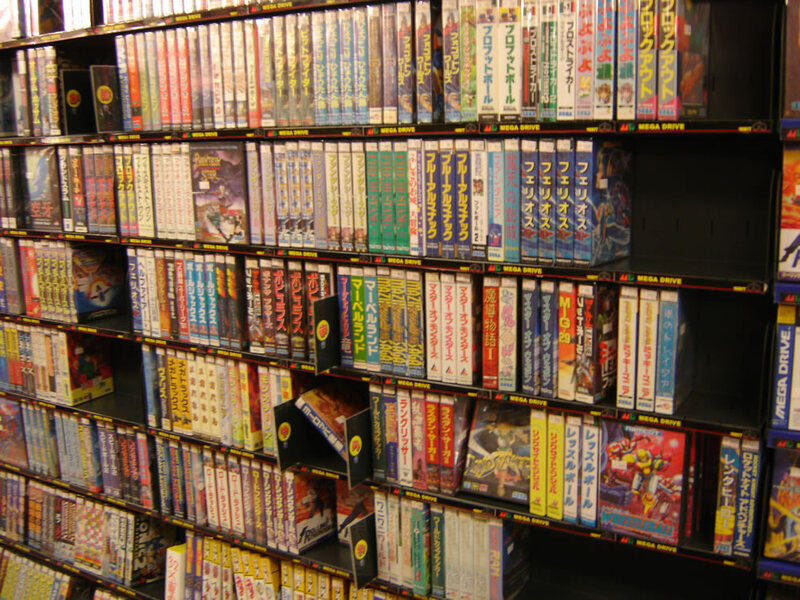 For many, it is the Mecca of video games, anime, manga, and the otaku culture. Having moved to Japan earlier this fall for a year of study abroad, I was of course very interested to visit Akihabara (or Akiba as it is commonly known) to see if it lived up to the massive hype. Can a place really exists where the streets are lined with retro Mega Drive games, arcades, and collectible anime merchandise? Having been there on a number of occasions, I can safely say that the answer is a very strong “yes.” For those who have not had the pleasure of coming to Japan and visiting Akiba, I hope this article will show off some of the highlights of the Electric Town, in particular what it’s like to shop for retro games. While the town isn’t limited to anime and video games (there are quite a few general electronic stores and a high amount of adult oriented stores as well), I have never seen so many video game stores in one place. Giant hovering arcades from Sega and Taito stand tall and proud, and if one ventures down the multiple side streets they will be greeted with many exciting small game shops that may house many rare import titles. 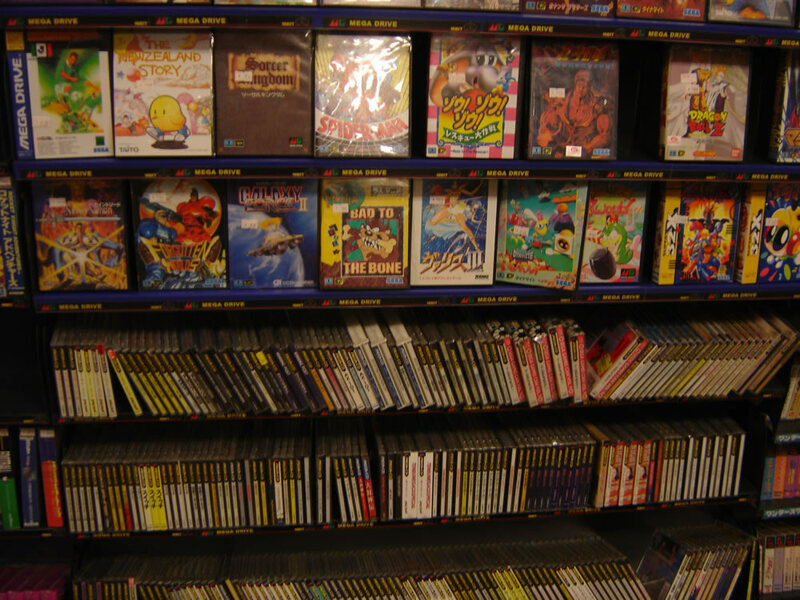 It can be very daunting at first on knowing where to even start in the hunt for video games. However, after visiting Akiba many times, I have found certain shops that I really like, and I’d like to share my findings with you. First on the list are the Game Trader shops. If we are talking about Sega gaming in general, these are a great place to find some good deals on Dreamcast titles. On the top floor of Game Trader 2, there is also a great selection of Mega Drive titles, as well as some very nice hardware in glass cases to go crazy over. The prices are good for the most part, and I recommend this branch of stores for those looking for retro gaming. Retro Game is another store that I really like, even if the prices are on the steeper side. It’s a very tight and narrow store, but there are walls full of Sega Saturn and Sega Dreamcast titles. The Mega Drive and Mega CD titles can be found upstairs, but the prices here aren’t the best. Still, this is just a fun place to venture into and be surrounded by many rare and obscure games. By far, my favorite place to buy Japanese games in Akiba is Super Potato. The name may sound silly, and the mascot may look even sillier, but in my eyes there could not be a gaming store with a better vibe and atmosphere. The outside is decorated with Mario and Pac-Man artwork, and usually the sound of 8-bit NES music can be heard from outside out on the street. Venturing up the stairs, one finds that Super Potato is spread across three floors. The top floor is a retro video game arcade, where you can play a nice selection of classic games such as Street Fighter II. The middle floor is for the more current hardware, as well as various soundtrack CDS and strategy guides, but the bottom floor is a place where true gaming heaven exists. 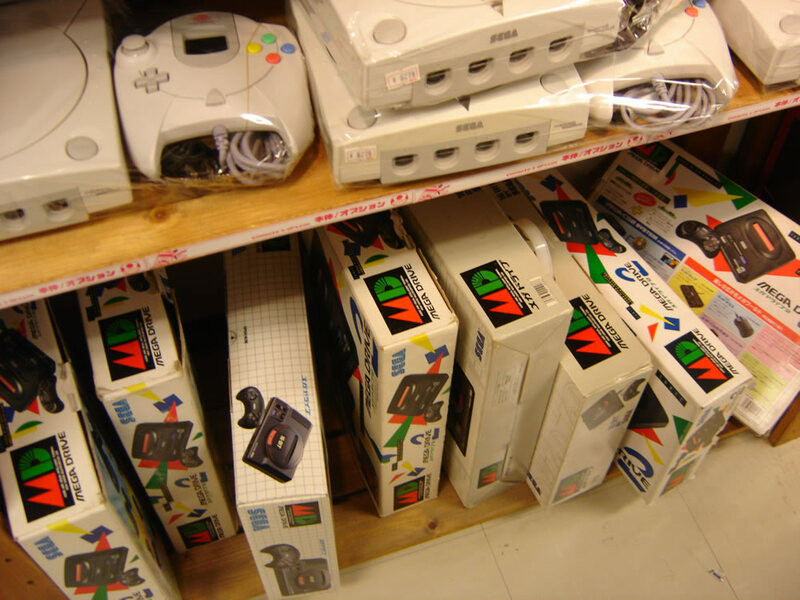 Never before have I seen walls and walls of the Japanese Famicom, Super Famicom, Mega Drive, Mega CD, Neo Geo, Saturn, Dreamcast, and other more obscure consoles like the NEC PC-FX. Super Potato is wonderful. The only real downside, is that the prices are kind of hit or miss. There are some great deals to be found, but sometimes they can be pricey as well. I was lucky enough to get my Japanese Dreamcast from them, boxed for less then the equivalent of $60, when most other stores in the area were selling them for nearly half that at the time. And this is really only scratching the surface of what Akiba has to offer. If one takes the time to look, there are plenty of game stores everywhere, as most of the buildings have multiple stories with different shops on each floor. And if retro gaming is not your thing, then one could indulge in a manga buying spree, or go to the various arcades to play the awesome claw machine games. Seeing Sonic’s face all over the city really makes me happy, especially at the Club Sega arcade, where our favorite blue hedgehog can be seen on multiple posters around the area. There’s just no shortage of things for anime and video game fans to see and do! 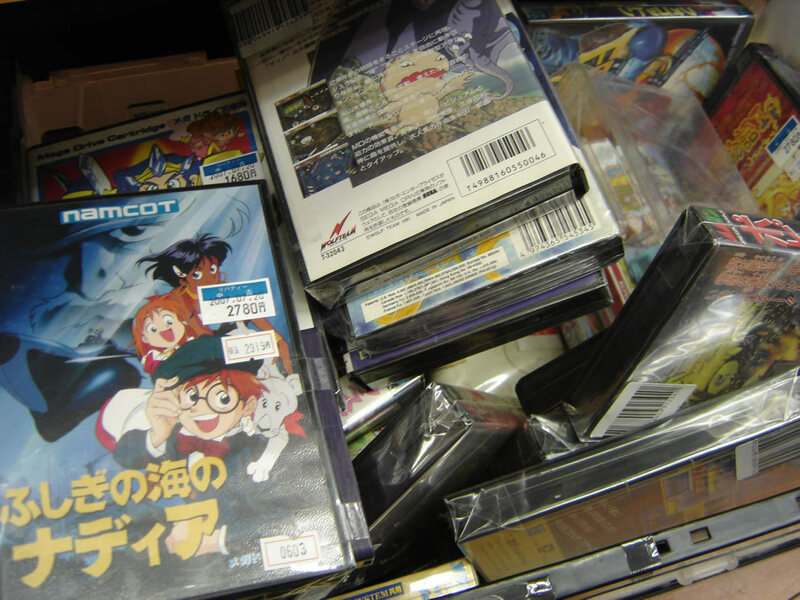 I’d say my number one tip for those shopping for retro games in Akiba is to look around! Don’t buy something at the first place you see, shop around and compare prices. The temptation to snap up a rare game you want as soon as possible may be hard to resist, but when there are so many shops with varying prices, you might be kicking yourself if you find the same title a few buildings down at half the price. Also, Akiba is a city that rewards multiple visits. It seems the turnover rates in many retro game stores is great, and even if you come back a week from your last visit, you’ll still find some new titles in the same stores. For collectors of Sega games, this means that you’ll potentially be finding rare import only titles every week! Akihabara is one of my favorite places in Tokyo and it’s a mere thirteen minute train ride from my school. I wasn’t sure if it would live up the hype surrounding it, but it has exceeded my expectations. Everything you’ve heard about Akiba is probably true. Yes, there really are just roads of stores selling video game and anime-related goods. Yes, there are multiple story arcades. Yes there are girls dressed up as maids handing out flyers for you to go to their cafes, and yes retro gaming is alive and well in Akihabara. It is a city where the gaming classics of the 16-bit generation are remembered and respected and for that, Akihabara, I salute you. Want to see more? Check out the video exploits of Sega-16’s Man in Japan!